It was in 2013 that the Australian team of Phillip Johnson & Wes Fleming were awarded “Best in Show” at the Chelsea Flower Show in the Centenary year of the show. 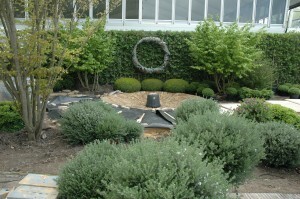 Many people were wondering how long it would be before we saw another Australian Show garden. Then along comes Charlie Albone who is not only a garden designer but also highly regarded in the industry as a TV presenter and writer. Chelsea is not new to Charlie who helped build Alan Titschmarch’s garden here last year. 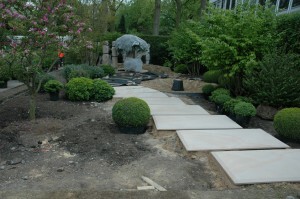 This will be the first time he has had his own show garden at Chelsea. The planning for the garden started a long time ago. 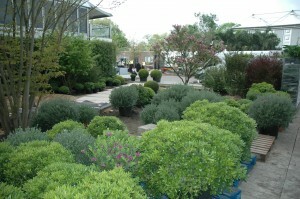 Charlie has sourced plants from Spain, Belgium and within the UK for his planting. The site has a good feel about it already and the site is located along the Main Avenue which as a garden designer is where you want to be. These photos below show the garden halfway through the build and we will have photos of the finished garden along with awards on our site as soon as available so stay tuned.